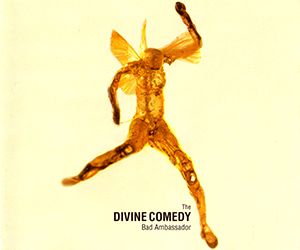 Bad Ambassador was the second, and much anticipated, single from Regeneration. Originally scheduled for release on May 7th, it was delayed for a week. The song is quite a favourite from the album, but failed to overtake Love What You Do, reaching only #34 in the charts, despite intense promotion. According to NME , the promo video, directed by Mike Mills, cost about £150,000. The Claire Burbridge artwork is also quite spectacular, despite not being in relation with the song. Like the Regeneration cover, it expresses a movement. The first CD features a couple of studio B-sides in addition to an edit of the song (without the end of ‘Timestretched’ overlapping). ‘Edwards The Confessor’ is quite a personal song from Neil Hannon, and is a less-produced version of the extra from the Japanese Regeneration release. ‘U.S.E.’ is an odd tune, with banjo it sounds different to the other Regeneration songs. The second CD is a live one. With a live version of the title tracks, it features a couple of B-sides. 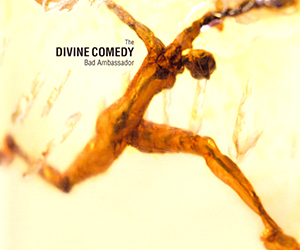 These songs were taken from a performance in Bristol touring the Spring UK tour, and voted by the DC BB (Divine Comedy Bulletin Board) community members. The Winners are ‘Sweden’ & ‘Pictures Of Matchstick Men’. I’m sure this will be no surprise (especially ‘Sweden’) as these were by far and away the biggest draws. and these combined made up the final 22% of votes. First in line was the live version of ‘Sweden’ which was quite different from the FIN tour. The next choice was then a cover version of Status Quo’s ‘Pictures Of Matschtick Men’ which is quite a rocker as well. In third position arrived ‘Your Daddy’s Car’, being an all-time favourite of the DC audience. However, this song having already been released in 5 alternate versions previously, the idea was dropped. So ‘Life On Earth’, another Fin de Siècle song re-arranged in a new form as well, was released as the B-side of the limited 7” release of the single.